Before I joined Weight Watchers a couple of years ago, I had attempted various diets and my weight had fluctuated for a good 20 years or more. The common factors and subsequent long-term failure in all my weight loss attempts, were mainly a feeling of boredom with the foods I was eating; (Chicken salad, chicken salad and more chicken salad), along with deprivation and guilt for the foods I loved. The Weight Watchers Propoints Plan has inspired me so much and has restored my joy and enthusiasm for food. Now I have lost the weight and intend to live this way for ever, I don't think of it as a diet, but as a healthy eating plan. Most importantly, I have no fear now, as I know and trust that I can recreate and eat all my favourite foods by being a little creative. I also have faith in the knowledge that I won't put the weight back on this time, as I won't allow food to ever be tedious again! 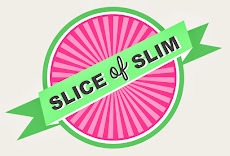 In order to do this, I am always on the look-out for new ideas or flavourings to help me retain the excitement in the ingredients I use, especially now I'm writing Slice-of-Slim. I don't want to feel bored with my dishes and I don't want you to either. 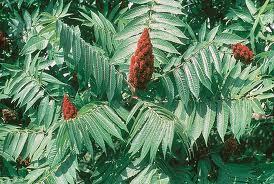 Sumac is a dried spice with an earthy, citrus tang. It grows in the Middle East and parts of Italy. Having done a little research on it, I discovered that the fruits from which the spice is derived, come from my favourite plant...I even have one in my garden as the colours in the Autumn are quite spectacular, but I never knew it was also such a delicious, culinary spice. I came across the dried form in Sainsbury's this week and I have really taken to it. It has a very distinctive flavour, but is not overpowering. 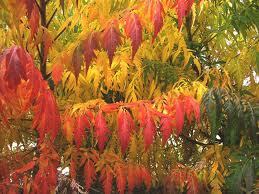 Unlike some spices, it tastes really good uncooked, so is beautiful simply scattered on salads. It has a slightly chewy texture, so isn't like a powdered spice. It also makes a wonderful 'rub' for meat or fish. It's 0pp/0kcal per serving, so another great reason to love it! The citrus flavour comes from the ascorbic acid it contains, making it high in Vitamin C.
I blended some sumac (the dark red spice on the left of the photo above), with some mixed, dried herbs, black pepper and a little cajun spice as a rub for some steak I was chargrilling. It was really delicious. I'm sure there are an infinite number of possible blends, so I will be experimenting. I think it would be fabulous simply sprinkled on its own, onto salmon before cooking, as the citrus zing would compliment the gentle and subtle flavours of the fish. The packaging suggests sprinkling it on houmous, which I imagine would be pretty fantastic! It will probably feature in quite a few of my recipes, so you may want to try and get hold of some for your spice drawer. Now I understand. I read the title of the photo whilst still half asleep without my glasses so no wonder I didn't 'get it'! Well I shall have to see if Tesco stock it since Sainsbury's is not on my route these days! May have to wait for a special visit! We enjoyed your kedgeree on Friday but I had a problem with the quantities. Did you mean each quantity to increase by each portion or just the fish. I had a great senior moment and was never any good at maths. Anyway there seemed enough for five people not three by the time I had made it. It was very delicious though. That is exactly what I did seemed like three very generous servings for the PPs so pleased I checked. Your I structions were quite clear. It was a pretty filling dish. G tells me you are driving him nuts as he is always on the trail for your latest 'find'! I now have the spice and he will have a Poundland expedition for the jar next. What an inventive cook you are to be sure. Today there is Magical mushroom soup wafting towards me and a square wrap defrosting. Egg whites to start with the pancakes and Sumac to sprinkle on my salad. You are like one's own personal chef!! !